India's performance so far in this World Cup has been beyond everybody's expectations. No one would have imagined that India will win the opening matches by such huge margins. Some fans are secretly fearing that the team has peaked too early in the tournament. In the last edition which India won, they raised their game to the next level in the knockout stages. It will be hard for them to do that this time around or to maintain the form they have shown thus far. Death Bowling has been India's nemesis for as long as ODI cricket has been played. It didn't play a part in the matches so far as the oppositions faltered before reaching that stage to exploit this weakness. It would be impossible to escape in the later matches and that is when the real test would be for the Indian bowlers. Batting at the Death. It has been a worry for India for some time now. Other teams, having players like Maxwell n AB De Villiers, have redefined the rules of batting at the death. Double the score at the end of 30 overs rule is a passe. New rule is triple the score at the end of 25 overs. With a fragile lower middle and lower order, it would be very difficult for India to catch up. Last and the most important factor. 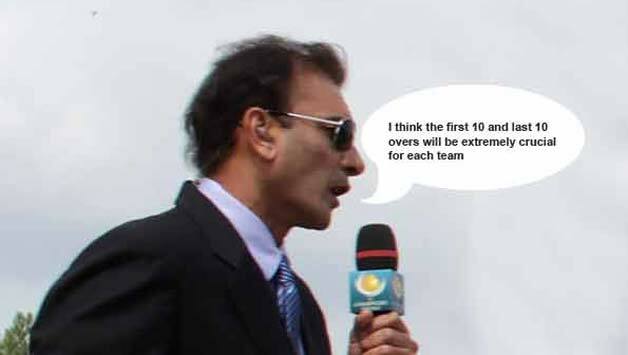 Ravi Shastri is not commentating this World Cup. Do you remember any glorious moment in the Indian cricket history in the past 2-3 decades when he was not up in the commentary box? Yuvraj's 6 sixes, WT20 triumph, WC triumph !